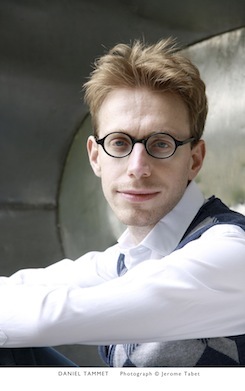 Owner of “the most remarkable mind on the planet,” (according to Entertainment Weekly) Daniel Tammet captivated readers and won worldwide critical acclaim with the 2006 Sunday Times bestselling memoir, Born On A Blue Day, and its vivid depiction of a life with autistic savant syndrome. In his fascinating new book, he writes with characteristic clarity and personal awareness as he sheds light on the mysteries of savants’ incredible mental abilities, and our own. "Where Tammet really shines are in his ruminations and reflections on the inner workings of his own mind"
"Far from a one-dimensional prodigy, his is a rich multi-textured intelligence. A beautiful mind." "The first several chapters provoke so many "Hey, listen to this!" exclamations that anyone sitting anywhere near you will learn a lot about cognition. Or feel compelled to flee the room." "The book, as perhaps befits its subject, doesn't just range or roam widely, it leaps like a chamois, hops like a grenouille, and skips like a carefree child, a faulty CD or a free-associating professor teaching Everything on a course in All Knowledge in the University of Life." "packed with his clear summaries of fascinating experiments... Recent debate has bumped up this book from delightful to vital"
"Born on a Blue Day won glowing reviews, was widely translated and has sold half a million copies. 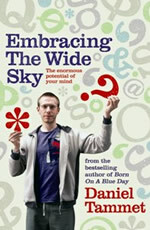 Embracing The Wide Sky is written in the same engaging voice and has similar autobiographical elements but is on the whole more outward-looking….The subtitle promises a tour d'horizon and Tammet delivers one, offering a quirky take on recent developments in such areas as linguistics, psychology and neuroscience….He is entertaining and informative about an impressive range of subjects...refreshingly sceptical about the received wisdom of the day…Embracing The Wide Sky is fun and inspirational." "Tammet seamlessly blends science and personal experience in a powerful paean to the mysteries and beauty of the brain. …Tammet concludes that all humans have something unique to contribute to the world, and he himself has a gift for rendering science accessible and even delightful." "...a well-received discourse about the potential of the brain..."